The Diocese of Boise is blessed with the gift of the Cursillo Movement. Please accept my sincere appreciation for your dedication in sharing God’s Word through prayer and action. As a Cursillista, I am aware that the Cursillo Movement is a fruitful source of evangelization and renewal within our Church. Through Cursillo, we have the opportunity to have a profound understanding of our relationship with the person and teachings of Jesus Christ and therefore be the voice of God’s love in families, parish communities and beyond. Thank you for the dedication you share with the priests, deacons and religious men and women in building the Kingdom of God in Idaho. Saint Francis de Sales said, “Truly it is a blessed thing to love on earth as we hope to love in Heaven, and to begin that friendship here which is to endure forever there.” This is also a reminder of the charism each of you has received from God to live out your faith in love here on earth as you fulfill your baptismal responsibility of sharing the Good News of Jesus Christ with the World. Please continue your good work of leading others to a more profound understanding of the presence of Jesus in their lives. 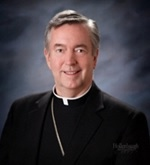 Be assured of my continued prayers for you and your ministries for the Diocese of Boise. Most Reverend Peter F. Christensen, D.D. Click the box above to make a credit card donation.